Compatible with all Dremel rotary tool attachments and accessories, 4300 Rotary Tool offers variable speed with electronic feedback. Product features universal 3-jaw chuck for changing accessories, pivot light for maximum line of sight and individual on/off switch. Product is available in Standard Edition which has 5 attachments and 40 accessories with deluxe storage case and Platinum Edition has 8 attachments with Flex Shaft, 64 accessories and ultra large storage case. Versatile tools are key when it comes to maximizing project time, so Dremel has developed a new solution: The Dremel 4300. It is the brand's most versatile rotary tool, with the ability to tackle an impressive variety of applications and with a wide breadth of accessories. The Dremel 4300 is compatible with every Dremel attachment and accessory regardless of size thanks to the universal three-jaw chuck. This means it does not require the use of additional hand tools to change accessories, saving time and hassle. "The Dremel 4300 has remarkable versatility because of its compatibility with all Dremel accessories making it a fast, smart tool for those looking for maximum efficiency," said Ed Pchola, Director of Dremel Product Marketing. "This tool makes sense for all kinds of users – Makers, Hobbyists, Crafters and DIYers – because it takes the guesswork out of finding the right tool-accessory combo. The Dremel 4300 is that solution." The Dremel 4300 also features an all new pivot light that users can adjust for optimum line of sight, providing illumination even in the most difficult-to-reach angles and spaces. 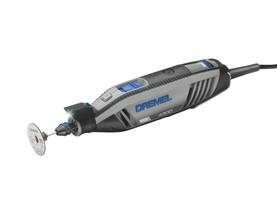 Additionally, the tool is powered by the Dremel brand's most powerful motor yet, featuring built-in variable speed and electronic feedback circuitry. These new qualities keep the tool running at peak performance, ensuring there is no drop in power. The Dremel brand knows comfort is key when completing projects, so they designed the Dremel 4300 with a slim, ergonomic body that provides a comfortable grip even during extended use. And, noise is kept to a minimum with an innovative airflow system that lets the 4300 run quietly and smoothly. The Standard Edition includes five attachments and a great all-around selection of 40 genuine Dremel accessories. The deluxe storage case holds the tool, attachments and accessories to keep everything together and organized. The Platinum Edition offers the highest value with eight attachments including the Flex Shaft attachment and 64 Dremel accessories. The ultra large storage case is equipped with metal latches, reinforced corners and a foam-lined drawer with a stay-closed glide system. The Dremel 4300 is available online and in store at select retail locations (Standard Edition MSRP $119.99 USD, Platinum Edition MSRP $199.99). For more information, visit www.Dremel.com. Since inventing the high-speed rotary tool in 1934, the Dremel brand has been helping Makers with its full line of versatile, easy-to-use tool systems that deliver the perfect solution for almost any job. From our Dremel rotary tools, Multi-Max™ oscillating tools, Ultra-Saw™ and Saw-Max™ multi-saws, and Fortiflex™ flex shaft tool to the Idea Builder™ 3D printer, Makers have come to know and trust the brand to complete their projects. Combining compact size, ergonomic design, precision and versatility with a wide range of highly engineered accessories, Dremel tools can be used to accomplish numerous applications in a variety of materials. Today, as a wholly owned subsidiary of the Robert Bosch Tool Corporation in Mount Prospect, IL, Dremel celebrates 85 years in business and maintains its commitment to innovation and quality. Regardless of what the task may be, the Dremel brand is dedicated to empowering Makers through creativity, precision and project enjoyment.